As part of our commitment to you, upon a visit with us you will experience a very thorough evaluation process in a very well equipped facility utilizing cutting edge technology and services. A new patient should expect 1 to 2 hours for the initial test and counseling visit, and 30 minutes to 90 minutes for the return fitting and verification session. 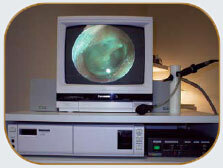 Close visual inspection of the outer ear, canal and eardrum by fiber optic camera. 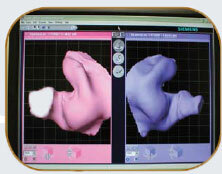 This procedure is entirely visible on screen to the patient. 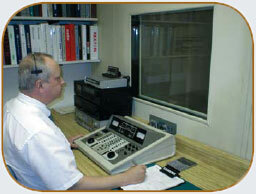 Pure tone and speech testing performed in our large Isolation Sound Suite. The completely enclosed booth isolates you from the person administering the test and all other sounds to guarantee accurate results. Test results are explained in detail to all concerned with any and all questions answered. Patients exhibiting any red flags, suspicious or obvious symptoms are always counseled to see their family physician as soon as possible. Our goal by this point is to have helped the patient to be well enough informed to make a confident choice about the level of technology best suited for their hearing and lifestyle requirements and budget. Ear Impressions for custom fit devices and earmolds, the ear is filled with a soft silicone material which will set up in less than 1 minute. The impression is placed in the iScan system, available exclusively from SIEMENS, scanned with lasers producing a 3 dimensional digital image, transmitted online to the laboratory for production. In case of loss or damage, a replacement aid can be produced, shipped to us, programmed and sent to you anywhere in the world simply by contacting our office. Persons whom are still quite physically active may require more service. Also, over time needs may change requiring adjustments to be made. 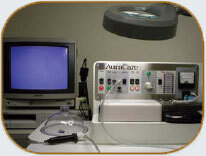 This specially devised system is used to dry and clean hearing aids and earmolds. Patients are counseled on use and maintenance and are encouraged to take advantage of the full range of services available. Routine visits are typically covered under warranty services and recommended each 3 to 6 months to ensure optimal performance and longevity.